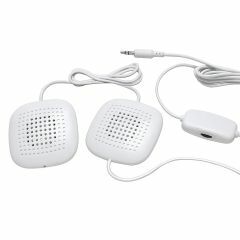 AllegroMedical.com presents the Sound Oasis SP-101 Amplified Stereo Pillow Speakers. The SP-101 connects to any sound therapy machine or cell phone/MP3 player so you can listen to music or sounds in optimal relaxation and comfort. The two high fidelity ultra-thin stereo speakers are perfect for surrounding one's head with music and sound for enhanced therapy or privacy.